Enjoying a glass of wine is more than just a epicurean delight—it’s an art form. That is… when the glass itself is art. Instantly elevate your enjoyment of fine wine with these elegant, hand-painted artisan wine glasses from Antoni Barcelona, inspired by the work Antoni Gaudí Cornet, the renowned Spanish artist whose breathtaking Sagrada Família Basilica in Barcelona draws over 2.5 million visitors annually. Recognized as, “sensual, spiritual, whimsical, exuberant,” by Time Magazine, the structure has become a nationally recognized landmark for Barcelona and throughout the world. Each Antoni Barcelona glass perfectly captures the essence of the Basilica’s breathtaking beauty—and its dazzling banks of stain-glassed windows that steal the breath of visitors worldwide. Hold these gorgeous glasses up to the light and experience mesmerizing colors and patterns so glorious, it’s as if the Basilica’s brilliant sunlit windows have come to rest in your hand. We agree. That’s why while many of our competitors turn out their glassware on giant, mindless machines that shape and paint with robotic arms, producing thousands of generic lookalikes, we combine quality and craftsmanship the centuries-old way: 100% by hand. Each Antoni Barcelona piece is masterfully shaped and mouth-blown by seasoned artists of the craft using traditional methods. Glassblowing, an art form which traces back to the Roman Empire, involves heating glass to between 1,600 and 1,900°F, then carefully forming the fiery-hot blobs with a keen eye and steady hand. After being crafted to the ideal shape, the glasses are painstakingly hand-painted by artists with more than 60 years of experience and an unparalleled attention to detail. The end result is a one-of-a-kind work of art that proves itself as the antithesis of lifeless mass production. But more than just beautiful, these artisan glasses are indeed designed for function, and are at once lightweight and solid to hold. The opening is wide enough for you to immerse your olfactory senses in deep aromatic bliss, and to experience the full complexity of the wine before indulging in your first sip. 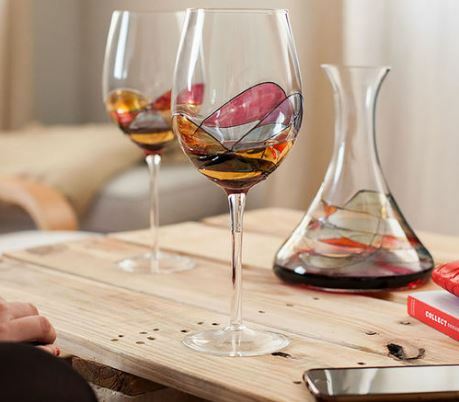 The graceful curve of the glass is delicate, with a long-stemmed base that rests easily between your fingers. The tall, slightly bowed sides allow the wine to breathe and release the hidden aromatic bouquets of your chosen wine. Swirl gently to release the aromas… sniff deeply… then sip. Mmmm. Wine tasting instantly morphs from everyday event into a transformative experience for all your senses. When nothing but the best will do, these sophisticated, vibrantly colored wine glasses make the ultimate gift for weddings, anniversaries, birthdays, housewarming, and beyond. Whether purchased for yourself or for someone who appreciates the finer things in life, Antoni Barcelona wine glasses are a true testament to luxury and fine living. Use them for absolutely any occasion, from formal holiday gatherings to casual dinner parties, or as a way to make weeknight indulgences more luxurious. Though delicate in form, the glasses are also durable, and with proper care will withstand the test of time. Because each glass is 100% handcrafted, there’s currently limited availability. Reserve yours today.